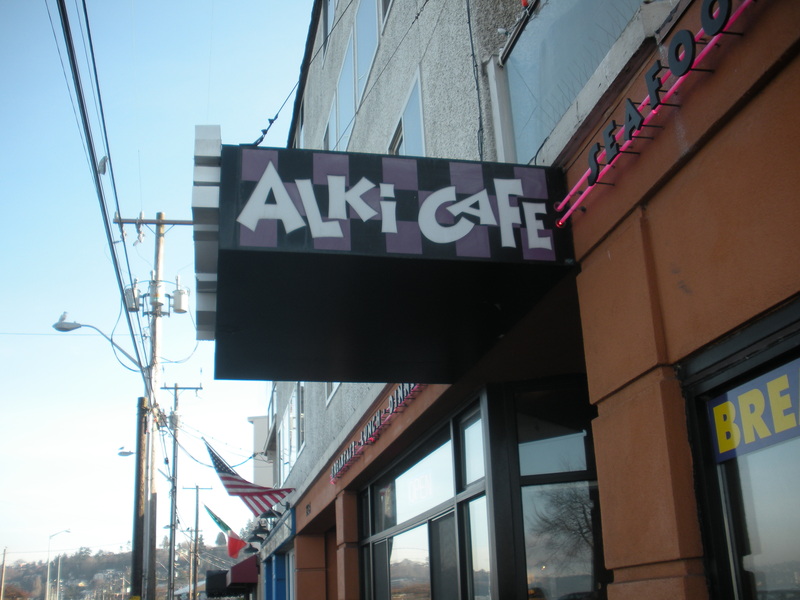 Alki Cafe Beach Bistro in West Seattle. This was a great place for breakfast and we ate here twice during our trip. 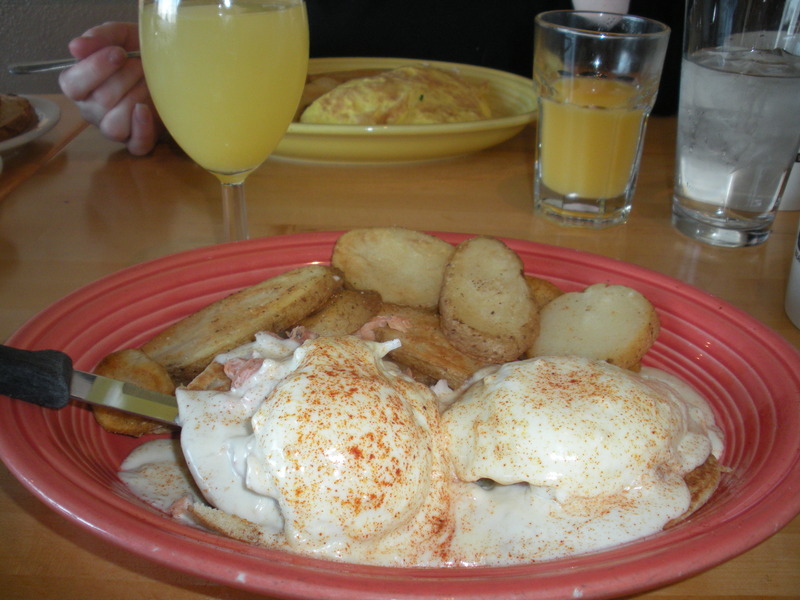 I loved their version of Eggs Benedict, which is made with an Asiago-Swiss cheese sauce rather than the traditional hollandaise. Many of their breakfast options feature seafood, and there’s also more traditional items on the menu. They also serve beer & wine (in my mind, a great bonus for a restaurant that closes at 2 pm). Locöl Barley & Vine in West Seattle: This was within walking distance of my sister’s house, so we also ended up going here twice. I was happy to sample several of their vegan items on the menu — kale chips and roasted root vegetable salad, while my carnivorous husband dined on Swedish meatballs and a pulled pork sandwich. Their extensive beer & wine menu features many options from Washington state. 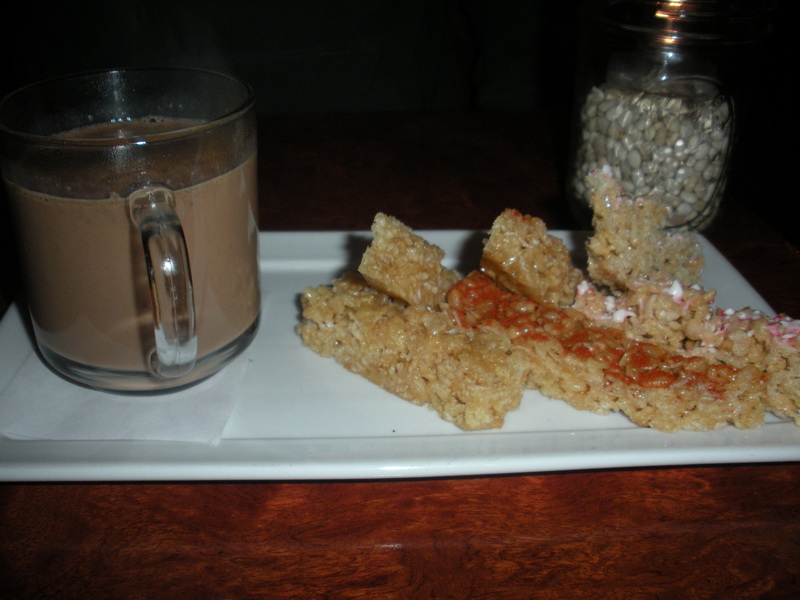 For dessert we shared one of their seasonal specialties: a trio of flavored rice krispie treats dipped in hot chocolate. On a day trip, we traveled about 90 minutes north of Seattle to the foodie town of Edison, Washington. 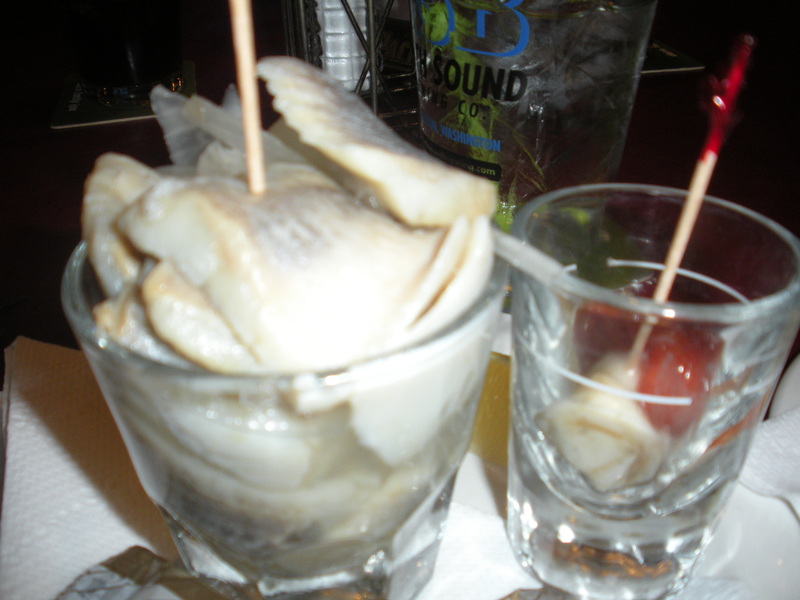 Here I sampled sour cherry bread from Bread Farm, bought locally produced wild caught tuna at artisanal grocery store Slough Food, and tried a Blau Oyster Co. oyster shooter and pickled herring at the Old Edison Inn. We also visited The Lucky Dumpster, a store featuring unique crafts made by local artists. 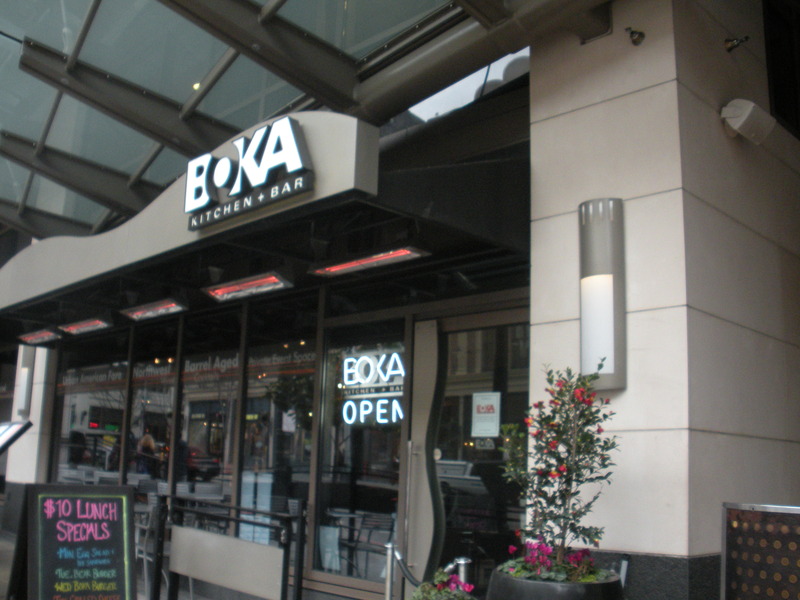 We had Saturday brunch at BOKA Kitchen & Bar in downtown Seattle. The portion sizes are a bit on the small side — which I don’t mind at all — and the food was excellent. Plus, they serve alcohol with breakfast, which is a huge bonus in my opinion. I had a smoked salmon tostada and a crimson mimosa — made with cranberry juice and champagne instead of orange juice — and they were generous on the champagne. Taking a break from eating, we visited the EMP Museum near the Space Needle. Admission is a bit pricy at $20 per person, but we had 2-for-1 tickets courtesy of the Entertainment Book. 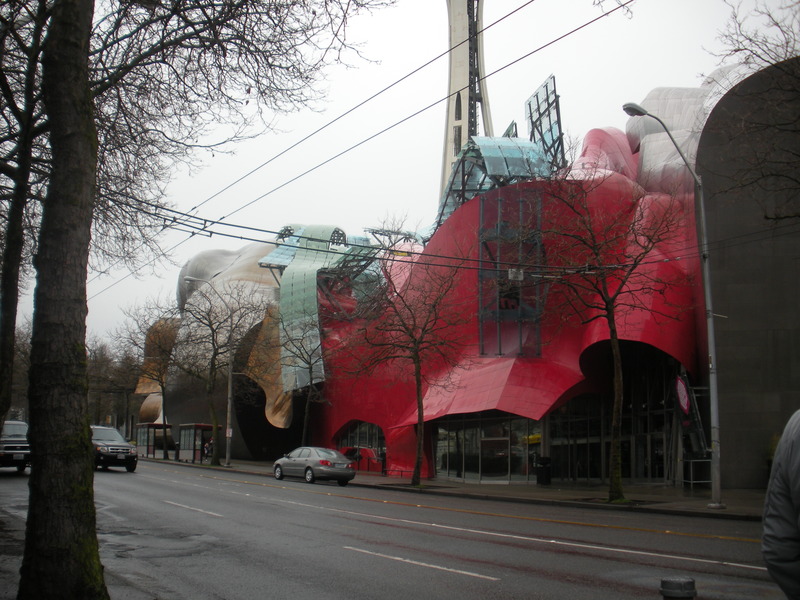 The EMP Museum features rotating exhibits on the Seattle music industry (think of bands like Nirvana, Pearl Jam and the Jimi Hendrix Experience), sci-fi and pop culture (we loved their current exhibit on horror movies having just watch The Evil Dead). One of the coolest parts of the museum is that you can form your own rock band (vocalist, guitarist, keyboard player and drummer) and mock-jam to a rock-n-roll song in a studio-like environment. Some of us really got into the guitarist role and had to buy a poster and DVD of the performance as evidence. The EMP Museum also has a fairly descent bar/restaurant at semi-reasonable prices. In the Queen Anne neighborhood northwest of downtown Seattle we stopped at El Diablo Coffee Company, an independent Cuban-inspired coffee house. With brightly painted walls, this place definitely has a lot of character. I tried the Cafe Cubano, similar to an espresso with an extra punch. The coffee house also serves pastries, cakes and a variety of empanadas. We took home a few bags of their whole beans, which was well worth the price of $12.95 for a 12-ounce bag. El Diablo is conveniently located next door to Queen Anne Books. Last, but not least, we ate at Spud Fish & Chips in Alki Beach. Built in 1934, it’s the oldest fast food restaurant in West Seattle and there are also locations in Juanita Beach and Greenlake. I had the halibut & chips with a side of cole slaw. 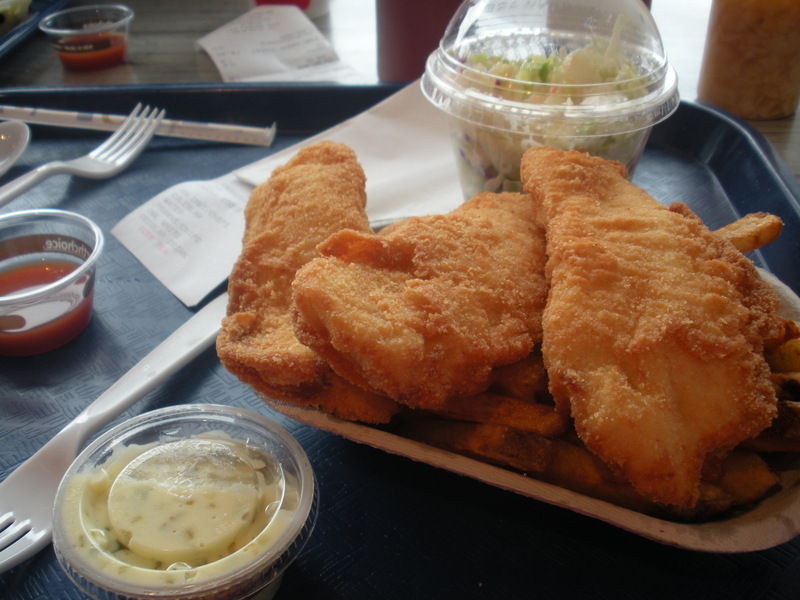 One can also choose from cod, oysters, prawns, scallops and clams, with or without fries, and clam or salmon chowder. The house-made infused vinegars (malt, red pepper and garlic) are a great addition to the fries. 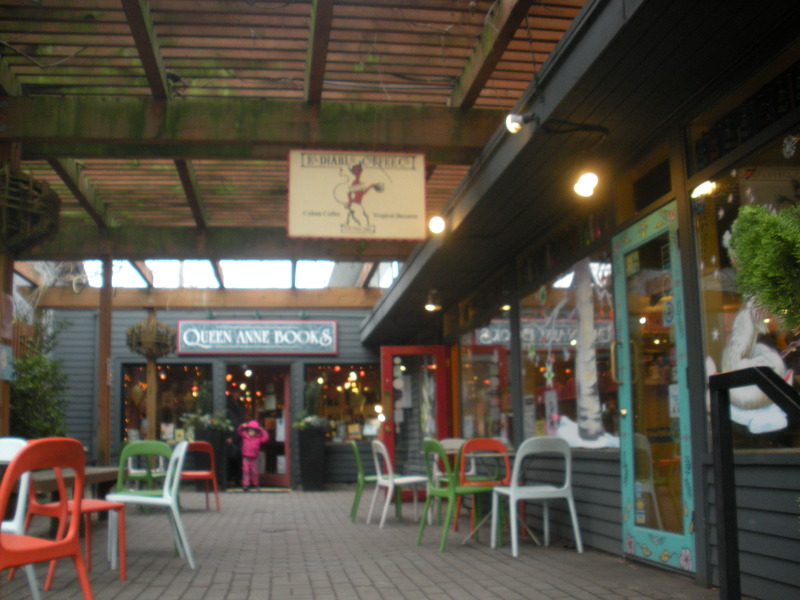 This entry was posted in Becky's Adventures, Restaurant Reviews and tagged brunch, coffee, eating locally, edison, food reviews, restaurant reviews, seafood, seattle. Bookmark the permalink.